i am s-l-o-w-l-y making progress on this quilt (just haven't felt like sewing at all). oh nice! I didn't realize you would be adding other colors to the yellow. I think this scrappy log cabin may be my next quilt pattern to try. Very nice fabrics! very pretty makes me think this winter might end soon. Well, it's looking great! I love the yellows, and the other colors added to it. Ooooh, I love it! A lot. Looks great! Love ALL the fabrics. You're doing a great job. Try hand piecing like I do, you can find more stolen moments to quilt instead of being confined to the sewing room. Keep going cuz it's going to be gorgeous when it's done! Nettie - thanks for your help in planning of the Coin Quilt - I have posted a pic today of the quilt... all sewn by hand, was a joy to sew actually..
Oh, Nettie...I LOOOOOOVE these blocks!!! So beautiful. I've got to try a quilt like this. Nice work! Oh Nettie, this is SO great! I'm totally craving a scrappy log cabin after seeing your cute blocks. Love it. Yep - hand sewing was a joy.... after almost a year of hexagons (1200 so far), this was a walk in the park!!! The blocks are gorgeous those colors are a dream. I have become totally addicted to log cabins and once I make my Cottage QB quilt I think I will make another log cabin one!! oooh lovely! 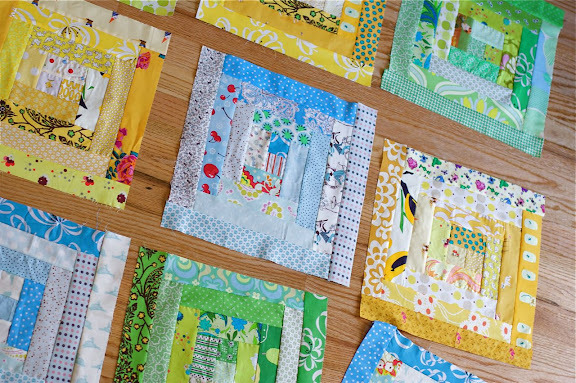 I like all the quilts you make - they are fresh and modern and you choose the nicest fabrics! Oh I REALLY, REALLY, REALLY LOVE this!!!!! It's very pretty. . you're doing a B-U-tiful job! such a beautiful spring project! it's looking great...i was feeling the same today...laid out all the project improv blue green blocks and didn't sew a one. maybe tomorrow. This is such a gorgeous color combination! Your quilt is going to be amazing! love this. what a great quilt it is going to be. I love how each block is a different color. They look so nice together! Oh they are sooo pretty!! This is going to be one beautiful quilt! oh no you can't lose your sewing mojo! Maybe when Spring finally gets here you will feel better. Love the blue blocks. Beautiful! I love these kinds of scrappy blocks. I really love thse colors! Very pretty! i love the yellow! and i know that feeling of not wanting to sew. I love it! I feel a log cabin in my future. This is just beautiful, Nettie! so pretty! i was just browsing flickr and was drooling over a log cabin quilt. and now after seeing these, i want to start another one!! i hope you feel like sewing again soon! I came back to say that I put this photo on my desktop for the day so I could stare at the fabrics some more! Love, love, LOVING these beautiful blocks!! 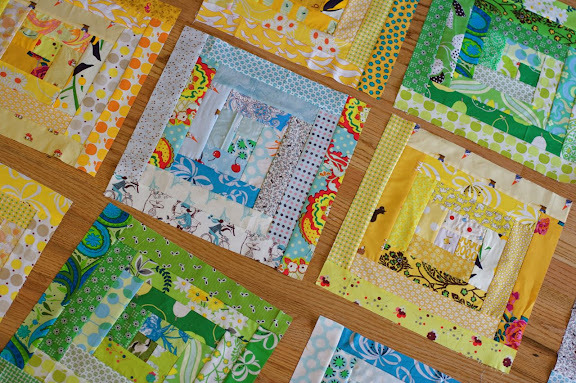 Kind of missing your bubbly posts and notes on here.. hope that you are out of your sewing funk and back soon..
Love your scrappy log cabin blocks!! Your blog is wonderful. So many cheerful happy stuff! i love the colors and though i'm longing to do a log cabin, i have two in process quilts also being sadly neglected as it's planting time here. maybe 20 minutes a day, but that never seems to work. Just wanted you to know that I followed your tutorial on making the baby quilt. It was great. thank you so much for teaching. I am just a beginner but loving learning. The blocks are amazing. They are wonderful. ANd that fabric!!! Love it. What a great idea. So pretty, can't wait to see the finished quilt, lovely. These look so lovely. I love the fabrics you're combining. It will be a gorgeous quilt. it's so inspiring to watch your progress! The blocks are beautiful those colors are a dream! Lovely creation ... you quilters amaze me ... do you ever use feedsacks or is that passe? Oh wow! That is going to be gorgeous!